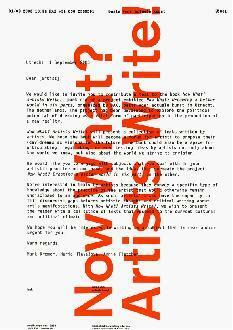 Collection of artists’ writings published as part six of the project Now What? Dreaming a better world in six parts, published by BAK, basis voor actuele kunst and Revolver, Archiv für aktuelle Kunst in 2004. Editors: Mark Kremer, Maria Hlavajova, and Annie Fletcher. Published by: BAK, basis voor actuele kunst and Revolver, Archiv für aktuelle Kunst.